It is so hard to believe that Easter is right around the corner. My family loves celebrating all aspects of this favorite holiday and the traditions that come along with it. 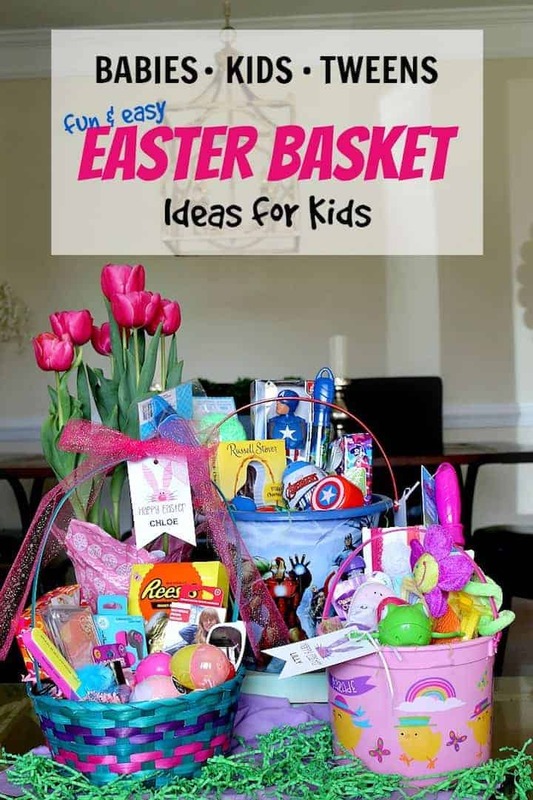 That includes decorating eggs, doing an Easter Egg Hunt and finding Easter baskets. 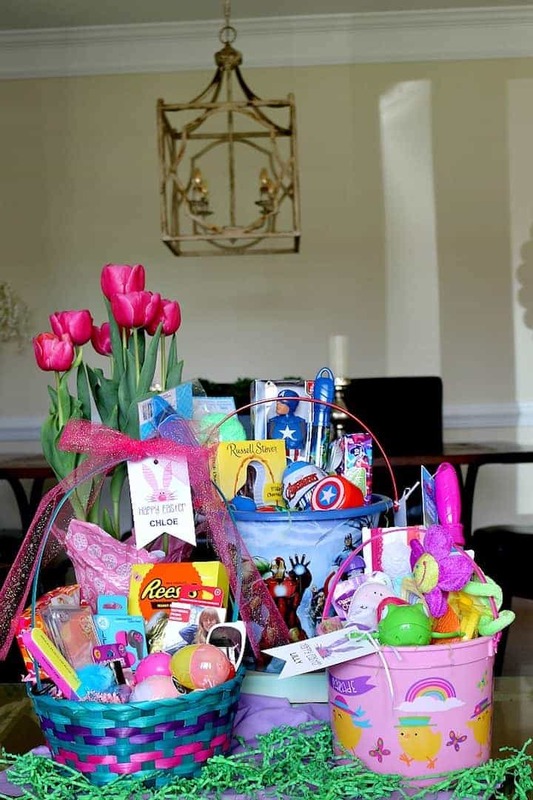 One of my favorite memories as a child was waking up Easter morning and rushing around the house to find our hidden Easter baskets before church. 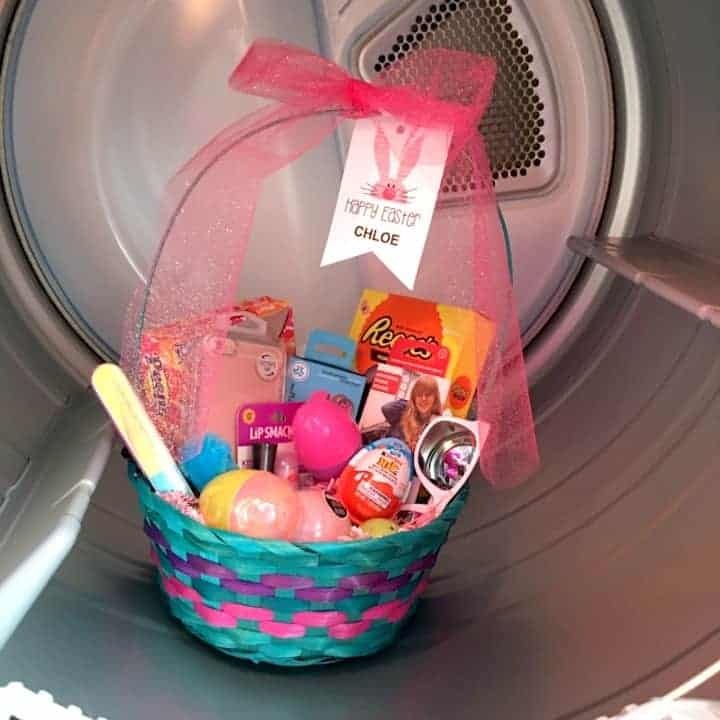 The ‘Easter Bunny’ always hid our baskets in the most peculiar places…in the dryer in the laundry room, in an empty kitchen garbage can, the cold oven, dishwasher, or even the filing cabinet in my Dad’s office. Honestly, sometimes I spent nearly an hour searching for that basket, all while my parents sat back and enjoyed a hot cup of coffee. Looking back now as a parent, the whole idea of hiding Easter baskets is pure genius; an opportunity for parents to steal a bit of relaxation while the kids are running around searching! 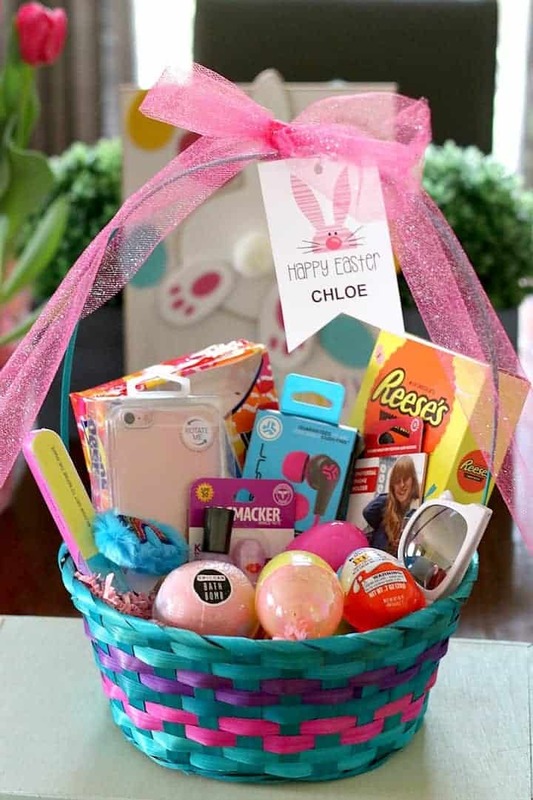 Every year, I make my family their own special Easter Baskets filled with things they love. My favorite go-to place for putting Easter baskets together is Walmart. Year after year, they always have great products at affordable prices. They just make shopping so much easier because they have everything I could possible need all in one place, and I know that I am not going to pay an arm and a leg for it all. 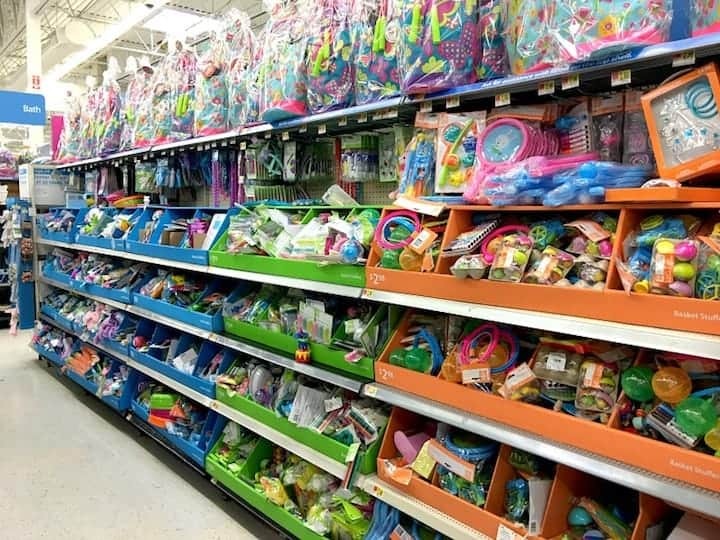 This year I was even more impressed than usual with their huge selection of Easter items – they really stepped up their game! 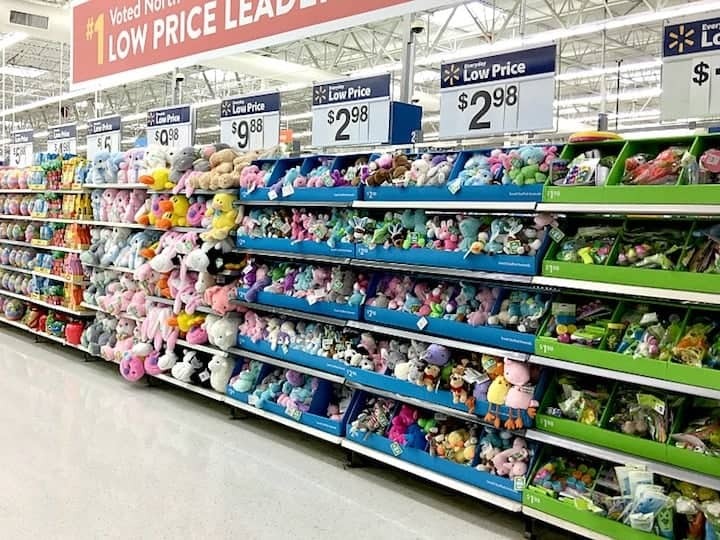 Check out all this Easter stuff in store at Walmart this year! 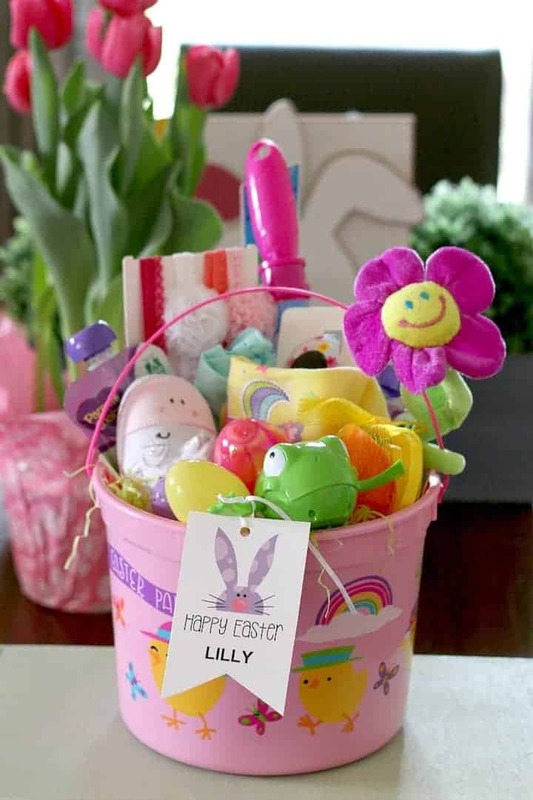 You’ll find a full aisle of an amazing assortment of baskets, containers, and buckets to use to hold all the Easter goodies. And Walmart has every kind of basket you could want, from the most popular on-trend characters pails to beautiful wicker and bamboo basket options. 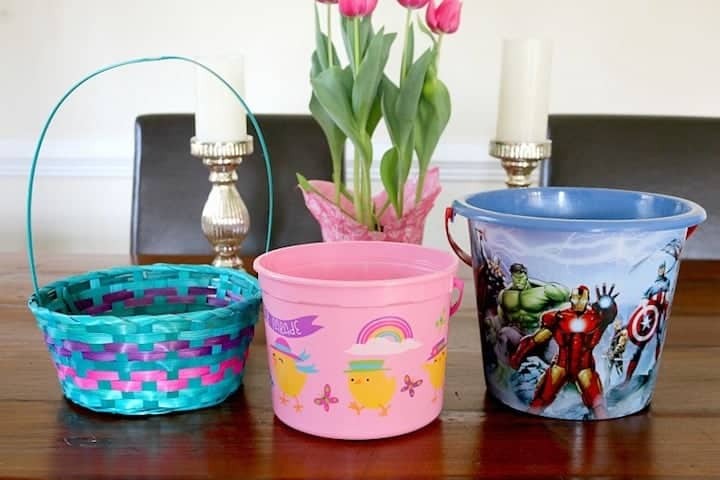 I LOVE to use the reusable pails/buckets as a basket because the kids get so much use out of them during the summer; at the pool, beach, and even in the backyard. The best $5 you can spend! I have three baskets to make this year, and the age range is pretty wide. I need something for a 1 year old baby girl, 6 year old boy and a 9 year old girl. That’s quite an assortment of goodies and why I love the convenience of shopping at Walmart for everything I need. 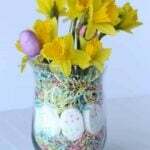 My favorite area to find fillers for Easter baskets is the Fill Your Basket bins section. There is one whole side of the aisle with items ranging from 98¢ to $2.98. That is A LOT of options to fit any budget! 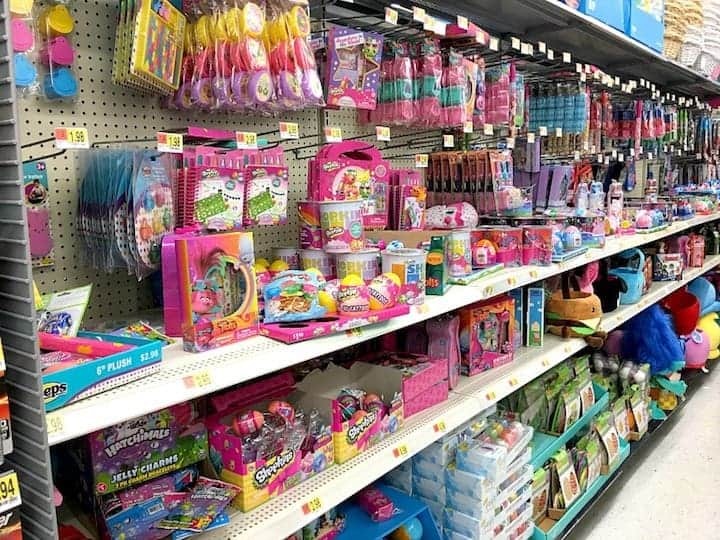 You’ll find licensed products featuring the hottest characters of the season and plenty of other great basket fillers all at Walmart’s everyday low prices. 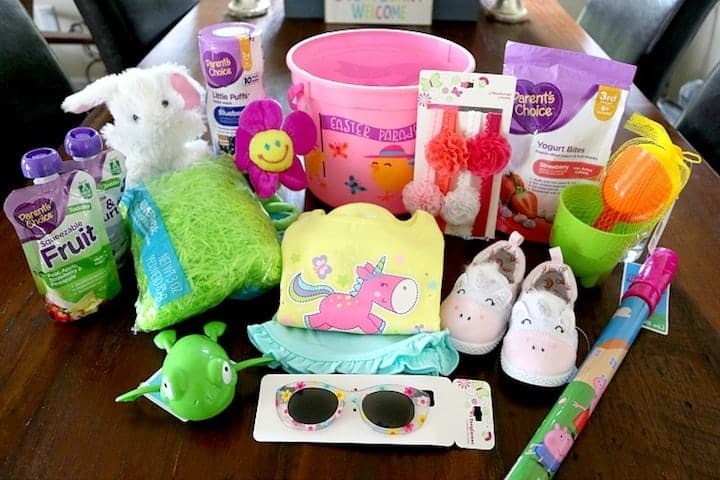 I decided to go with more of a summer theme for the baby basket filling it with some clothing, water toys, bubbles and a plush bunny. Since candy isn’t an option at this age, grab some Parent’s Choice Puffs and Yogurt for your little ones. 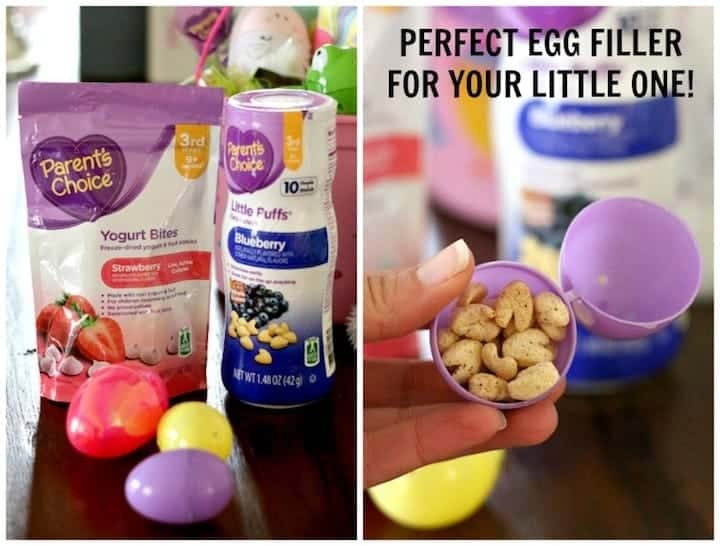 They make the perfect egg fillers, and your baby will feel just like one of the big kids with their plastic eggs full of treats. And how adorable are these canvas unicorn slip-ons? They make a perfect little basket stuffer for just $4.98! I also snagged a cute bubble stick, a 4-pack of cute headbands – similar here, this cute unicorn graphic tee and some other goodies. If you have a boy, then I am sure you are no stranger to the Avengers! Superheroes are always a hit with the boys and with the new Avengers movie soon to hit theaters, they are more popular than ever! So…I decided to go with an Avengers themed basket this year. 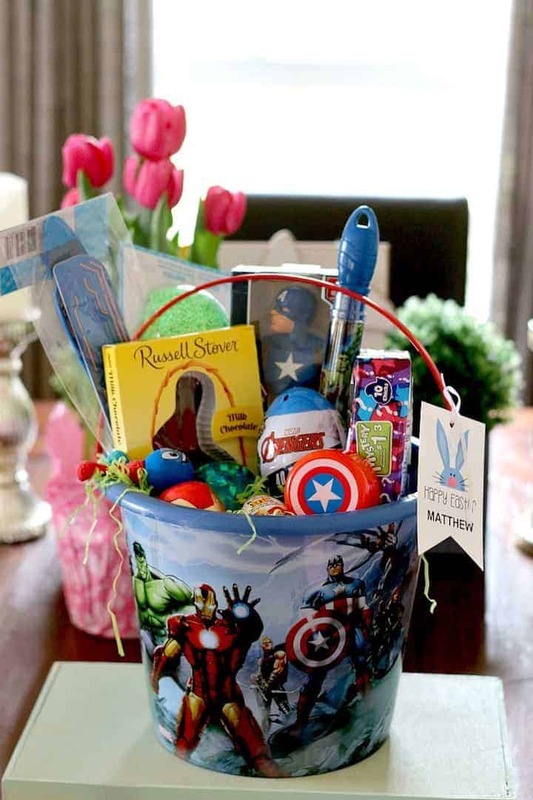 The Avengers plastic pail was the PERFECT vessel to hold all of these favorites for Easter. 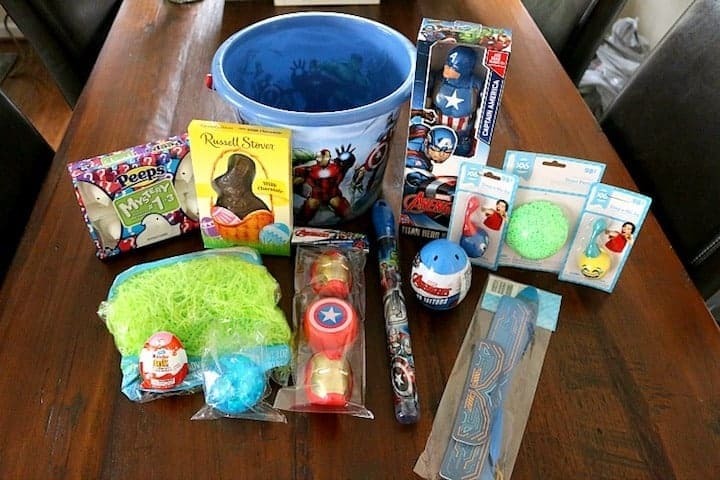 I also snagged an Avengers bubble stick, a Captain America action figure, a chocolate bunny, a Kinder Joy Egg, Peeps Mystery Flavored Marshmallows, some green putty and other little fun treats. Let’s be honest…that tween age can be a challenge to buy for these days. They aren’t babies any more yet, and to their dismay, they aren’t old enough for some of the things that come with being a teenager! But I had no worries about finding items for my 9 year old’s basket. 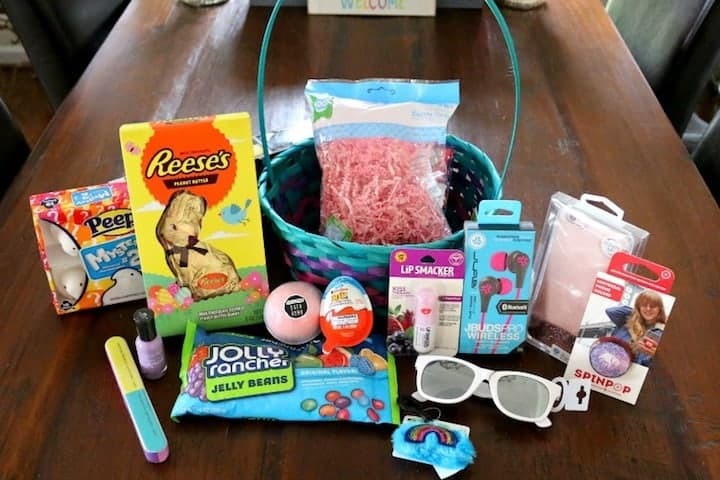 I picked some sweet treats like this Reese’s Peanut Butter Bunny and Jolly Rancher Jelly Beans and some cute accessories like these sunglasses and a pink phone case. From spa-related items like this unicorn bath bomb and Lip Smackers lip balm to quality electronics like these wireless ear buds, Walmart has me covered. I hope you’ve found some inspiration for filling your Easter baskets this year. There is no doubt that Walmart is the place to go for all your Easter needs. No matter the age or interests of your child or your budget, Walmart will have everything you want this Easter – at a price that can’t be beat. I couldn’t be happier with how these Easter baskets turned out. 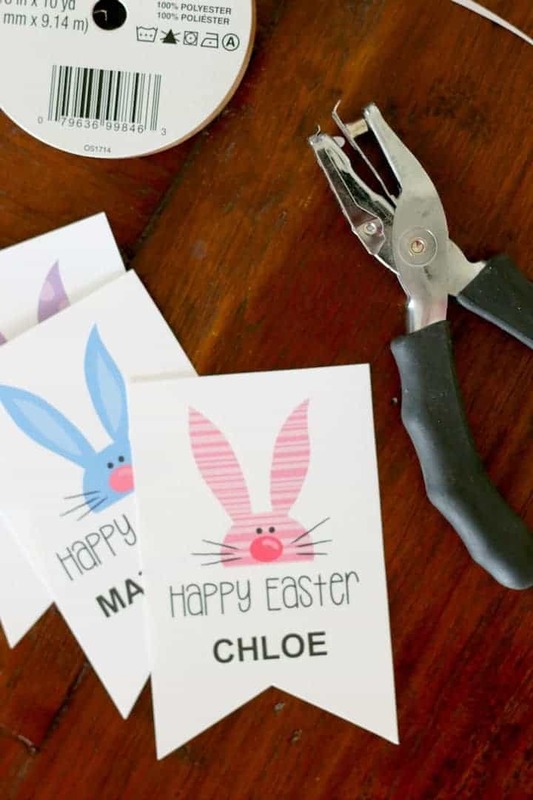 And to finish things off…I created this adorable bunny Easter Tag Printable with each of their names. I’ve included a copy for you here! It’s an editable PDF, so just click on the blue field and type in your child’s name! I simply used a hole punch and a thin ribbon and tied it to each basket! Voilà! It couldn’t’ be easier. 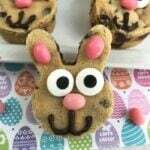 Enjoy and Happy Easter! I love your baskets. They are very creative.